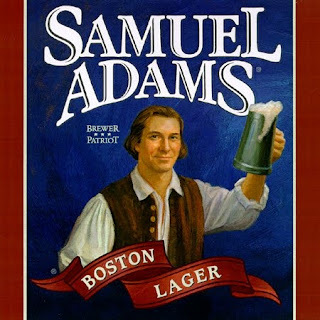 Sam Adams: cheers to truth, justice, and the American way (to drink). I'm not really a big fan of cross-border shopping. I believe that, generally speaking, the quality goods and services in Canada is better than anywhere in the world - especially groceries, restaurant food, and general helpfulness and friendliness of wait staff. Boston lager that actually tastes like the city of Boston - the Common, the U.S.S. Constitution, the Tea Party, and Cheers all rolled into a bottle. In a good way. The slightly lower alcohol content than some beers (4.75 per cent) simply means "more to enjoy." Actually a restaurant in Chicago, Carson's has got the greatest rib sauce in the universe - a billion times better than Tony Roma's. No, really. The tangy, spicy sauce comes in pints, and must be consumed in 30 days, which means that even when you just get it, you're almost out of it. At the restaurant, they give you a bib, so you can really go to it. Sam Adams and Carson's ribs, meet your maker. Oink, oink. Smoother and even better than Cherry Coke, though a crime against your stomach if you drink it in more than small doses. Once widely available in Winnipeg - I found it at Food Fare and Sobeys as recently as a couple of years ago - it's now impossible to find north of the border. I once had a student who bought 100 plastic bottles of the stuff and rationed herself to one a day. When it ran out, she got the shakes. And, yes, cherry plus any beverage is magic. Speaking of magic, the magic ingredient in anything is cinnamon. We have Nature Valley Granola Bars in Winnipeg, but they're withholding the good stuff on us: cinnamon granola bars are Nature Valley's crack cocaine. It's about time that someone load their trunk with them and sell them for $25 a box after the bars close on Corydon. No, no, no, it's not "cookies," it's "cereal!" I can't believe I actually talked my mother into letting me eat these things when we lived in Boston. Every kid secretly believes that cookies with milk on them will be fantastic, and this product makes those dreams come true. An unholy blend of Oreo meets Cap'n Crunch, it'll make any kid's (and some adults') eyes pop out with glee upon sight alone. The big lie now: "They're made with WHOLE GRAIN!" Uh, OK, whatever excuse you wanna use works for me. You get an iPhone, you need a holder. There are three iPhone cases at Future Shop, and a million iPhone cases at any Apple Store in the U.S. - rubber, plastic, leather, steel, concrete - take your pick. And the tattooed clerk at the checkout will even give you her opinion on the aesthetics. The one newspaper that demands you read it in print as well as online: why can I only get the Sunday edition delivered on Monday for a million bucks with a Globe subscription, when a mere, two-hour's drive away, it's available at cover price seven days a week? I want to download novels and electronic editions of newspapers and have them all in one, light, portable, carrying device where I can access them anytime - on the bus, at school, in the bathtub - just like my American friends do. Please, Amazon, help a young boy's dream come true. I picked up some of this stuff in the U.S. a couple of years ago, when it had a different name and themeline. Now Alka-Seltzer just goes for it: it's "dependable hangover relief!" It's also more honest about its target audience: hard-drinkin' manly men. Like me. Ha! A group of beer-lovin' students tested this stuff for their Buyer Beware advertising assignment, and found that it actually works. If I have a headache - usually not beer-related, but you never know - this stuff does seem to put a spring in my step, at least until a nap is feasible. You'll be happy to know that this stuff tastes as terrible and chalky as the original. As the commercial sez: "Wake up. Man up." Wow! Cherry Dr. Pepper really made an impact on you Kenton. You've name dropped it several times since your return. For me it's Cherry Coke for sure. I also know exactly what you mean about its availability up here. Sobey's always had it, then suddenly they didn't. I used to go to the Sobey's in Birds Hill town to get it because they still carried it. I always drink a Cherry Coke when I'm down south. I'm lucky though because my truck driving father will often bring me home a case of whatever I want when I ask. On newspapers: I've always been a big fan of USA Today. I always enjoyed reading it when trucking with my dad. Krispy Kremes- Lovin' em since 1997! Salsa Verde Doritos- Impossible to find. Frito-Lay only sold them regionally and may have cancelled the flavour altogether. Boo! Aleve- The OTC pain reliever so good that Canadians are forced to smuggle it back over the border in a Tylenol bottle (Just guessing). Oh yeah: I forgot about Krispy Kreme. Aleve: yep, though I've never tried it. Maybe I should! Cherry Dr. Pepper: I'm drinking one right now. I bought the last two cases in stock at Wal-Mart. Aleve is now available here. Not sure if it's the same stuff, but it's everywhere. $5.49 in today's Safeway flyer.